Stop the finishing rolls coming from the rewinder and release rolls to the V-type Slat Conveyor according in order.change the gap conveying into the continuous conveying. 1. The Stop Sorting Deck is composed by the 12 unit. Working width is 4800mm, unit width is B=400mm, the lifting of unit is realized by the pneumatic tyre..
2 Stop sorting deck uses the release and clamp paper structure. 3 Chrome Plated on surface of stop sorting deck. 5 Mounting in the concrete ramp. 6 Equipped with pneumatic control cabinet, the pneumatic brake is fixed in the cabinet, easily to check and overhaul. Equipped with air tube, the air source is connected to the pneumatic control cabinet by the user. 7 The operation is finished on the site operation platform.. Looking for ideal Paper Roll Packing and Cnveying System Manufacturer & supplier ? We have a wide selection at great prices to help you get creative. All the Paper Roll Handling System are quality guaranteed. 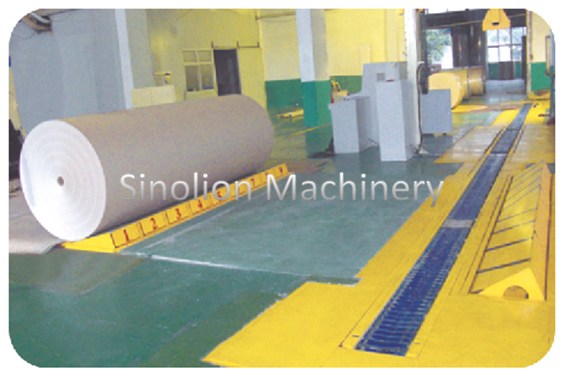 We are China Origin Factory of Paper Roll Wrapping and Conveying System. If you have any question, please feel free to contact us.